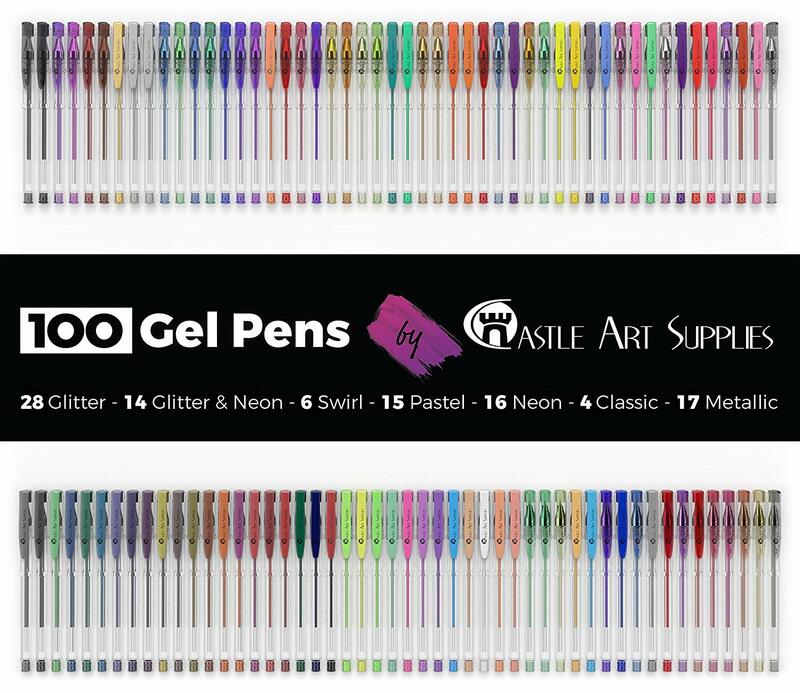 THE ULTIMATE ‘GEL-TASTIC’ SELECTION featuring 100 smooth, free-flowing fine tip Gel pens with all the colors of the kaleidoscope (plus some pretty neat special effects too). VIVID, VERSATILE AND EFFECTIVE our Gel Pens work brilliantly on multiple art and craft projects including; scrapbooking, coloring, drawing, writing, journaling, detailing, designing, letter writing and of course…doodling. SMOOTH, FREE-FLOWING INK glides effortlessly across your paper, card or alternative surface…get ready for a big effect with little effort and no catching. Plus! Our quick drying ink makes smears and smudges a thing of the past. 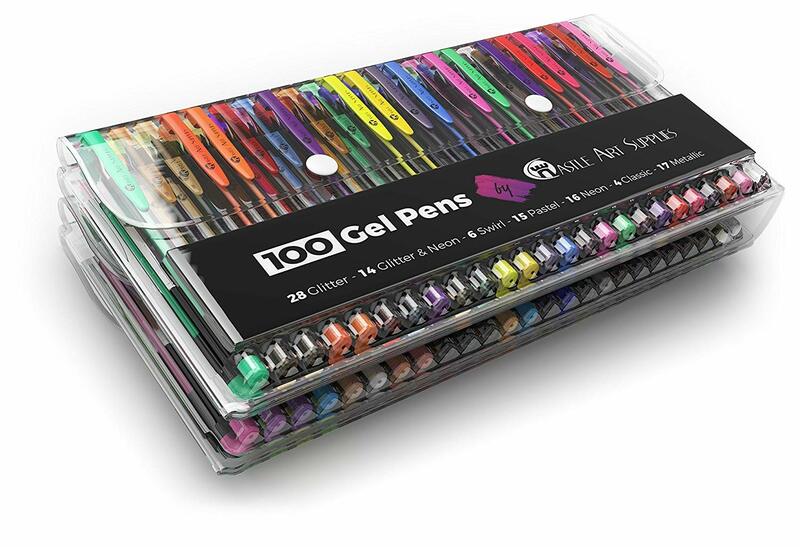 Our bold and beautiful set of 100 Gel Pens combines the smooth ink-flow of the rollerball with the clever mechanism of the ballpoint…allowing the ‘ink-credible’ deeply pigmented, luxurious gel ink to flow onto your page with the minimum of fuss. 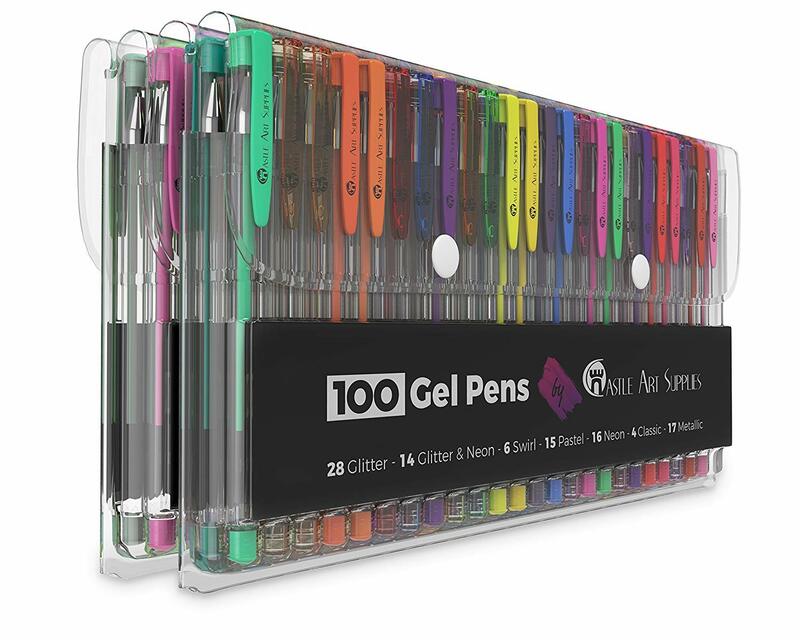 There really are no limits to your creativity with this GEL-TASTIC set of 100 fine tip gel pens. Adorn even the smallest note, memo or To-Do list with a little creative embellishment and help brighten up the world one doodle at a time! 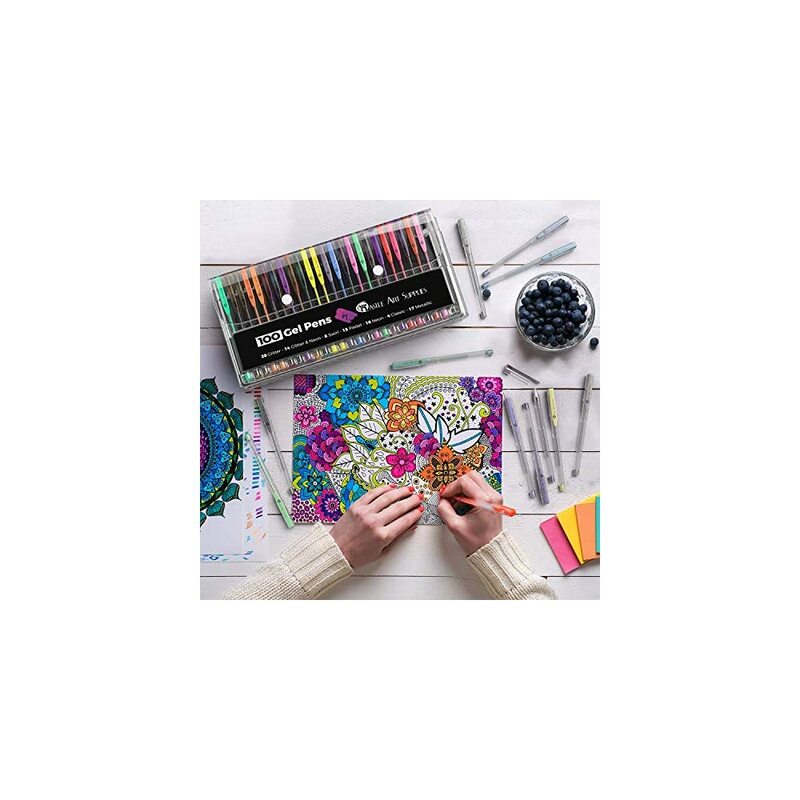 The kaleidoscope of colour in our selection, featuring pastels, bright shades, metallic effects as well as special glitter, swirl and neon gels will delight coloring fans of all ages. They are so comfortable to use that we think they will struggle to put them down (so please be patient!). And for the detailed artists among us the fine tips will allow the addition of stunning intricate design elements. 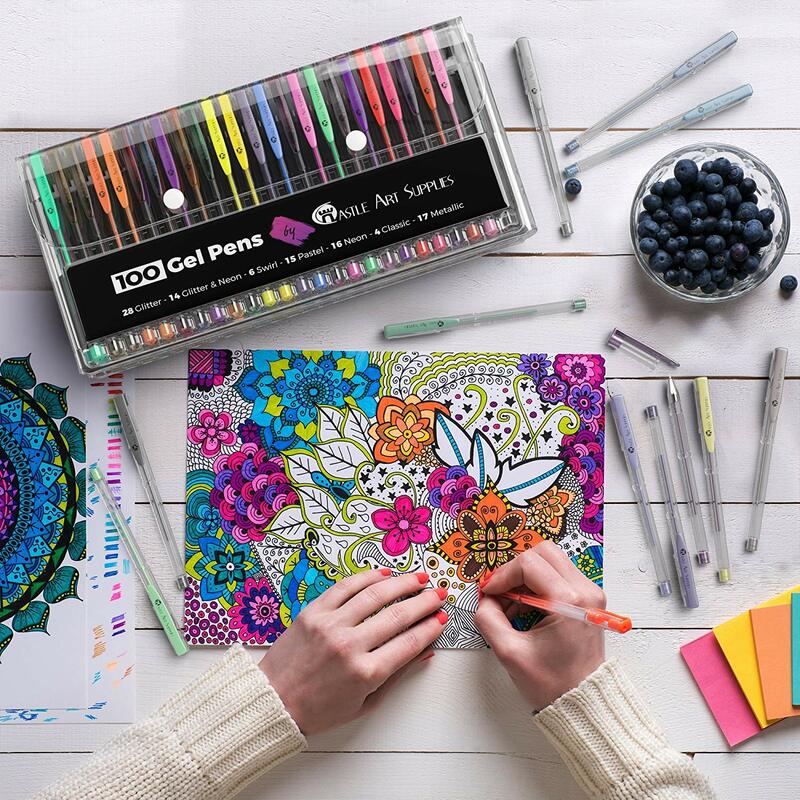 And with their non-toxic, acid-free credentials, these Gel Pens get the Castle Arts seal of approval and we can confidently recommend them for family crafting activities and art projects on a range of materials including smooth surfaces. You can even paint with them. And don’t forget our COLOR HAPPINESS GUARANTEE. 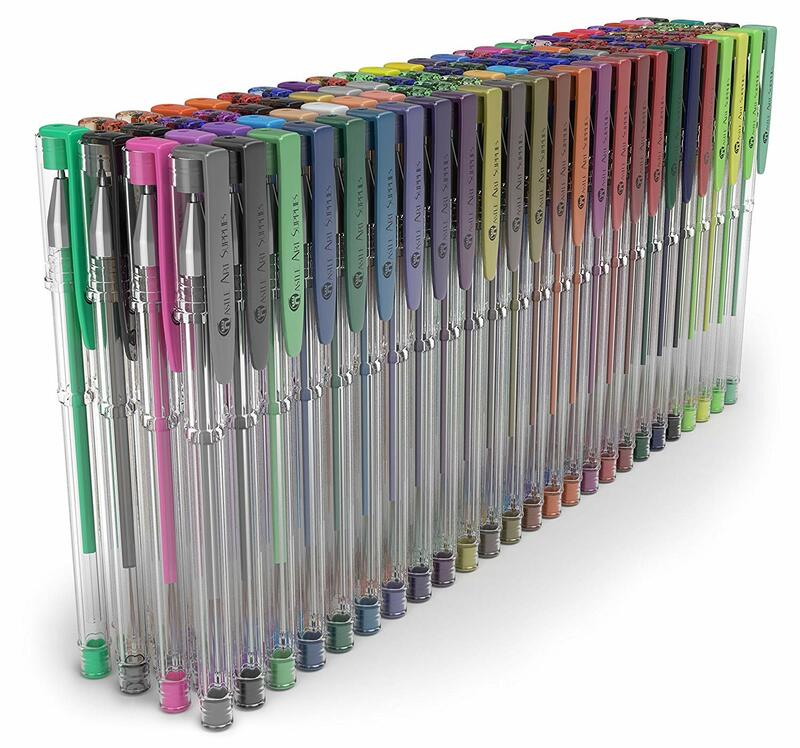 At Castle Art Supplies we are always confident to stand behind our brand and offer our exclusive ‘Color Happiness Guarantee’ – if you’re not happy with our Gel Pens please let us know and we will be happy to replace or refund them. NEW SPECIAL EFFECTS including swirl, glitter, neon and metallic gel pens. Impress your friends, teachers or co-workers with your latest eye-catching designs. NON TOXIC FOR CHILD FRIENDLY FAMILY FUN…our non-toxic, acid-free range is ideal for even the youngest of artists making this the perfect gel set for all the family. I love my adult colouring books, they are a great way to relax, these gel pens will be a great addition to my collection.